When I came across this color palette, I had to look no further! kitchen (or should I say stand still..lol) and these are the colors I am working with! My fellow teammates hit this one out of the park this week! 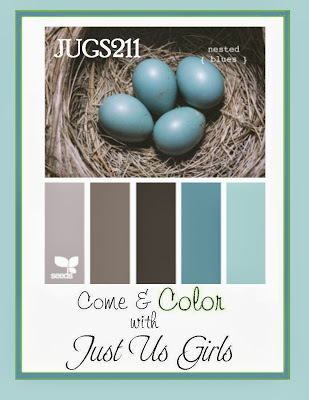 Please won’t you join me over at Just Us Girls…we would love it if you would! The Victorian cut strips were made with my Fiskars cutter. Heart punches, pop dots and white gel pen. Please won’t you join me? Categories: Cards | Tags: Card making, Cards, color challenge, Happy Birthday, rubber stamps, Verve Stamps | Permalink. I’ve got to tell you again…..gorgeous! Love the design of this and that beautiful poppy stamp. It’s perfect with this color combo…well done! Fabulous colors this week!! I saw 2 grays apparently I missed brown 😦 – how? Who knows — LOVE LOVE LOVE these fun Verve flowers!!! I’m with Vicki, I saw grays. lol Love the browns, though! Took me a while to find your comment section LOL! Just LOVE how you used this Verve poppy!! Gorgeous card!! So pretty. I really like blue and brown together also. Your flower and pretty papers are perfect together, and the award banner at the bottom is a perfect touch. Gorgeous card, Nancy! 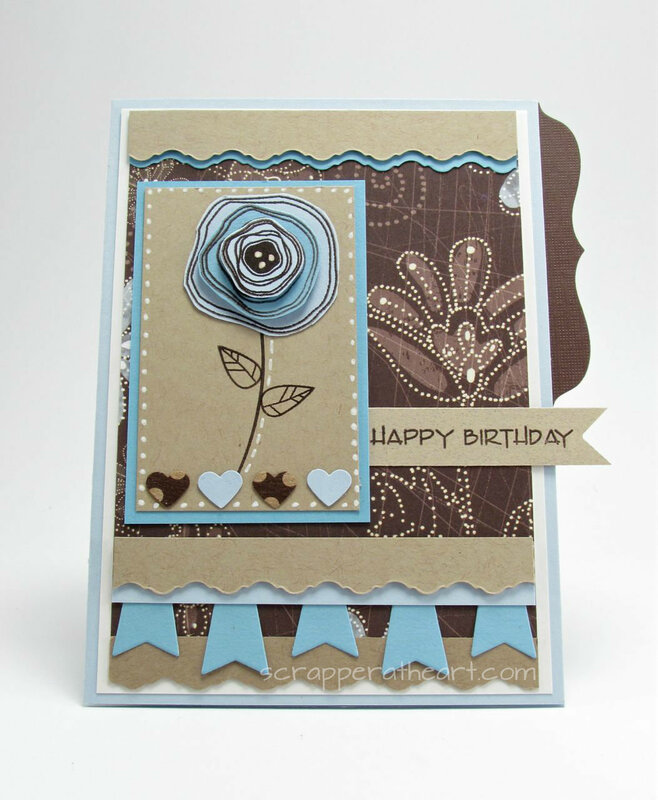 Love the blue & Kraft color combo and that poppy is so pretty! I also saw these colors are grays! Love this color combo, blue and brown are so pretty together and you definitely nailed this one! Hi Nancy! How fun that we used the same set for our cards! I love yours with that pattern paper next to your flower! This is a great card! Love this card Nancy put together!! The brown and blue look great together. In LOVE with that layered flower! FAB colors, too! Great card, Nancy!